Although “Destiny of the Republic” ostensibly covers Garfield’s entire life, it requires just thirty-two pages to review his first forty-eight years (up to his attendance at the Republican convention which nominated him for the presidency). And the entire second half of the book is reserved for just the last eleven weeks of his life. Such emphasis implies this is no ordinary presidential biography…and, indeed, it is not. In part, Millard’s book is a popular historical narrative describing the intersection of the lives of four men: James Garfield, Charles Guiteau (his assassin), Dr. Willard Bliss (his primary treating physician) and Alexander Graham Bell (who invented a device intended to locate the assassin’s bullet). But it is also a scathing indictment of late nineteenth century medicine – and of Bliss’s incompetence, in particular. “Destiny of the Republic” is a fascinating tale that reads more like a dramatic novel than a politically-focused presidential biography. And although this book touches the entire arc of Garfield’s lengthy political career, it is far more focused on his assassination and the negligent medical treatment which led to his death. Character development during his childhood, his military service, the evolution of his political career and his presidential legacy are far less a focus of the story. To its credit, Millard’s book is extremely well-written and supported by careful research. While seemingly designed for wide appeal and not with the intention of uncovering new insights about Garfield’s politics, it is engaging, easy to read and provides interesting personal insights into Garfield, Chester Arthur and others that I have not seen elsewhere. Despite being less broadly focused on Garfield’s life than I would have liked, Millard provides greater attention to his family than I expected. And as an added bonus she often provides excellent historical context (political, scientific and cultural) which provides the reader an excellent “feel” for the era. But while this is not a lengthy book, it is beset with multiple story lines following multiple characters. Although the narrative segues seamlessly from one thread to another in the book’s early chapters, this phase-shifting eventually grows distracting. Alexander Graham Bell’s story, in particular, becomes overemphasized and a bit tiresome. Millard’s focus on medical malpractice also diverts attention from other compelling facets of Garfield’s life such as his final political battle with New York Republican party boss Roscoe Conkling – a scoundrel so perfectly nefarious that he deserves his own best-selling biography. And Millard makes the occasional mistake of exaggerating Garfield’s importance. Without taking the hyperbole with a grain of salt one might almost ask why his face is not carved into Mount Rushmore. Overall, “Destiny of the Republic” is a spirited, dramatic and fascinating tale focused on events leading up to the death of President James Garfield. Judged solely as a probative presidential biography this book falls short. 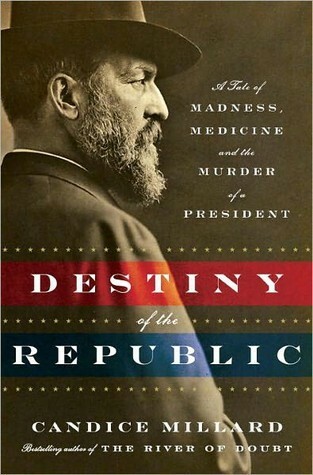 But as a popular historical narrative focused on the death (and somewhat the life) of James Garfield, “Destiny of the Republic” is quite successful. Indeed – post coming out this morning on this very topic!